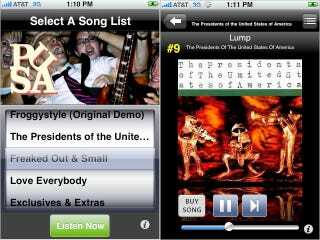 Now that that's in your head for the next 60-90 minutes, you can consider plonking down $3 to stream PUSA's complete catalog to your iPhone/iTouch. Is this the future of iTunes music distribution? Since it's only a streamer, the app basically serves as a $3 rental of the band's entire catalog, including the rare 500-cassette-only demo FroggyStyle which you've been scouring for on eBay. If you want to listen to the music outside of the app, there's a handy link to the iTunes store to purchase everything you'll stream.